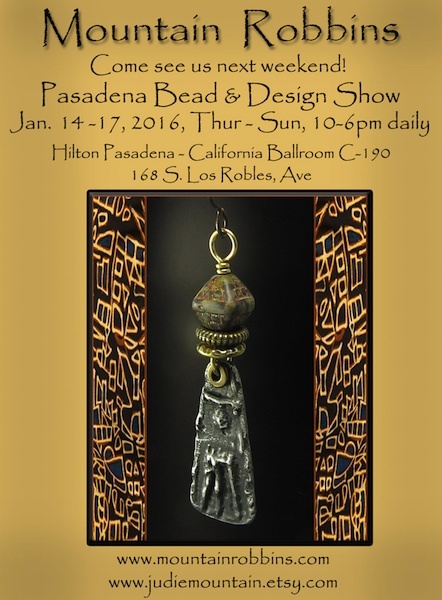 We are looking forward to heading out to beautiful Pasadena for thePasadena Bead and Design Show. For several years now this show kicks off a new year for us followed by the Southwest Art Festival on the Empire Polo Grounds in Indio, Calif. and then our annual trip to Arizona where we do the 5 day Tubac Art festival and visit the Tucson Gem and Mineral Show. Please come by and see us if you are in the neighborhood of any of these shows. We will be sending out emails a week before each show to remind you of the dates and locations. Hope you can stop by.